With the Reports Tab, WizeHive provides you with the ability to create and edit reports that are based on your data. In other words, you can create spreadsheets pulling in selected fields from your forms, and export this data, filter based on particular criterion, and sort the applications based on filters. 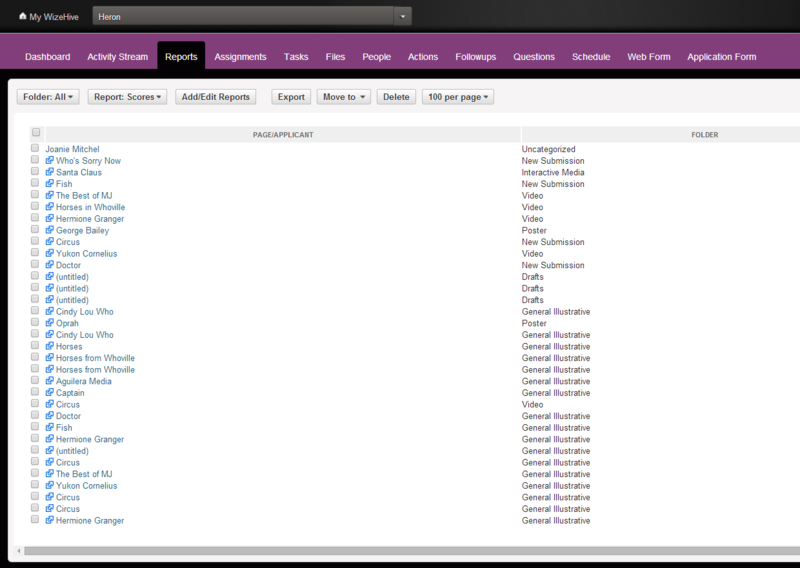 In this tab there are buttons across the top that allow you to perform a variety of reporting activities and also define the number of records to view at one time. Clicking on the blue Page/Applicant names will bring you to the corresponding applicants form. You can order the report by any of the given fields by clicking on the field name in the grey bar at the top of the Report. For example, clicking Page/Applicant will alphabetize the report by the name of the applicant. This feature allows you to report on the information has been submitted as an entry as well as any information regarding recommendations, Internal Forms, Follow-up Forms, Review Forms, Webforms, etc. In short, the fields associated with any form in the Workspace can be jointly reported on in this tab. On the Reports tab, click on Add/Edit Reports. 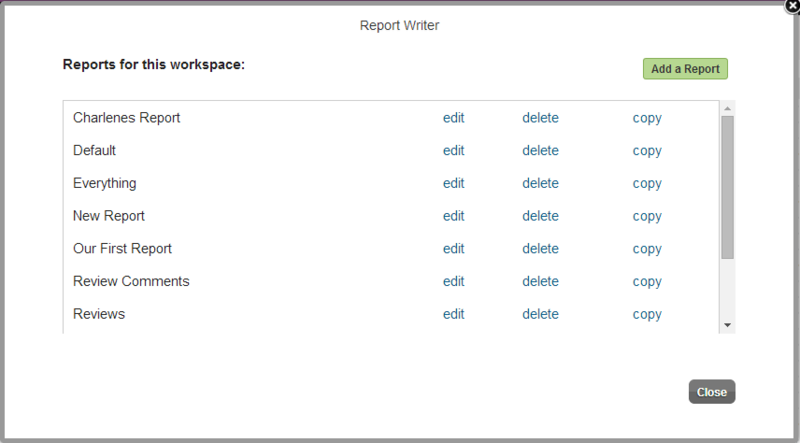 The Report Writer window will show with a list of the Reports you have already created. You can click Add a Report to create a new report or you can copy an existing report and make changes to it. You also have the option to edit or delete existing Reports in this window. After clicking edit or Add a Report you will be brought to the window below. Select Fields: Shows all available fields for your report. The yellow bars indicate the source of the fields. The first set are Standard Fields, and the additional bars represent various forms from your Workspace. To create a report, after identifying a name for your report, select the fields from the forms that you wish to report on. Click on those fields and they will appear on the Selected Field list on the upper right hand side of the screen. 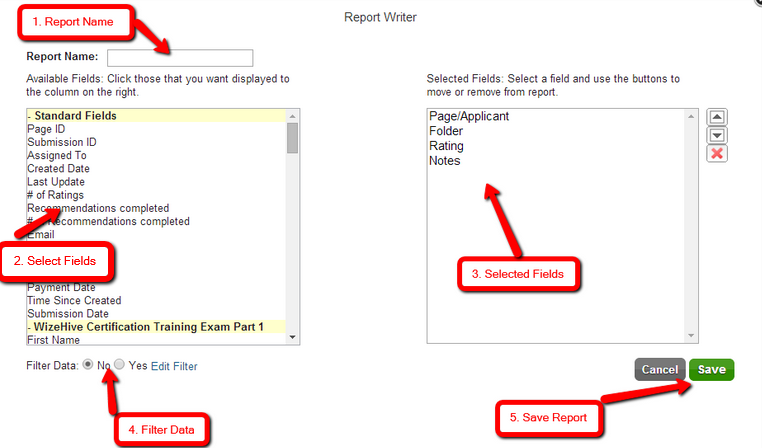 Selected Fields: The list of fields that will show up on your report. Think of this as the columns in an Excel Spreadsheet. To remove fields from this list, select the field, and click on the red X. If you want to change the order of the fields, click on the field in the right window and then use the up or down arrows. Filter Data: If you wish to filter your results, change the Filter Data to Yes and click "Edit Filter" (you will be brought to the screen seen below) then select Field, Operator, and Values. When you are done setting up your fields and filters, click Save to save your Report. Then click Close on the Report Writer window. Save Report Make sure to press save before leaving this window to save your changes. 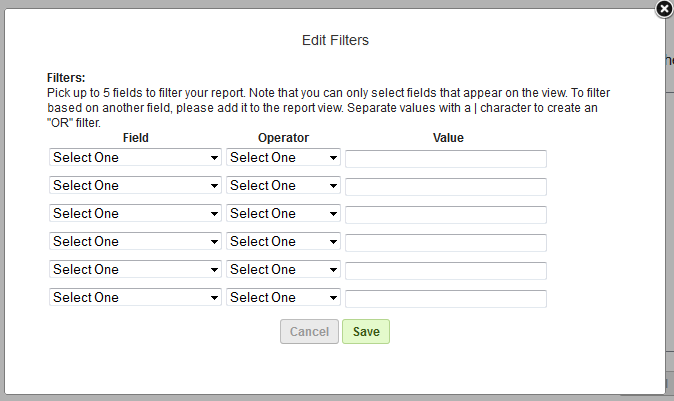 If filtering your data, note that fields must already be in a saved report before you can view them in the Edit Filters screen. Once you have added the needed fields and saved, you can now set filters on those fields. The Field dropdown, the first column, will contain all fields in your report. The Operator column allows you to specify your criteria. Do you want to view all responses that equal a particular response exactly? For example, do you only want to view applicants who put NY as their state? Do you want to view all responses that are greater than a particular response? For example, do you only want to view applicants whose GPAs are greater than 3.4? Do you want to view all responses that contain a particular phrase? For example, do you want to view any applicant who had the phrase "nuclear engineering" in their essay? In the third column, you should enter the value in question. In the examples above, you would put "NY", "3.4", and "nuclear engineering", respectively. If you would allow for multiple responses - if, for example, you are looking for applicants from NY, NJ, or PA - you would utilize the | punctuation mark to serve as an "or" So you would put State equals NY|NJ|PA in order to view individuals who put New York, New Jersey, or Pennsylvania for their State. Use the 'Export' option within the Reports tab to export a .CSV file of your selected report. Please note that larger reports may take a few minutes to export.